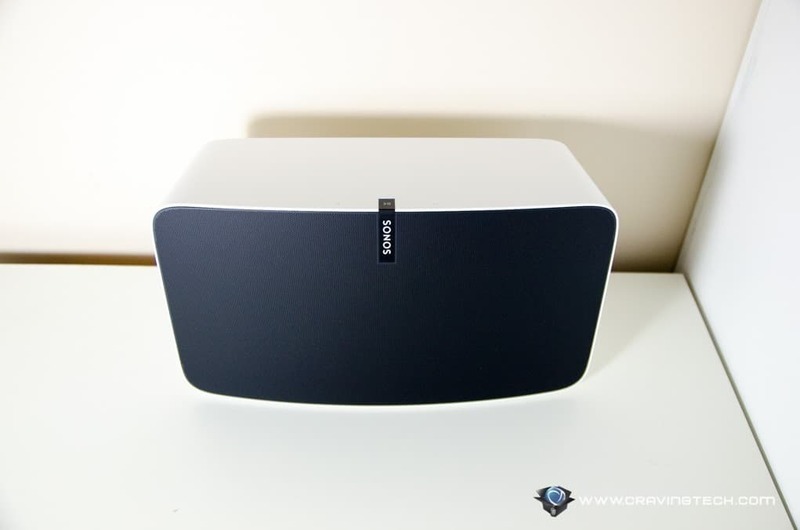 Sonos PLAY:5 (2015) Review – Sonos Play:5 speaker is the mother of all other Sonos speakers, compared to the PLAY:1 and PLAY:3 I reviewed previously here at Craving Tech. For a start, the PLAY:5 is much more massive, designed to fill bigger rooms with 6-digital amplifiers individually coupled with 6 speakers (3 tweeters and 3 mid-woofers). 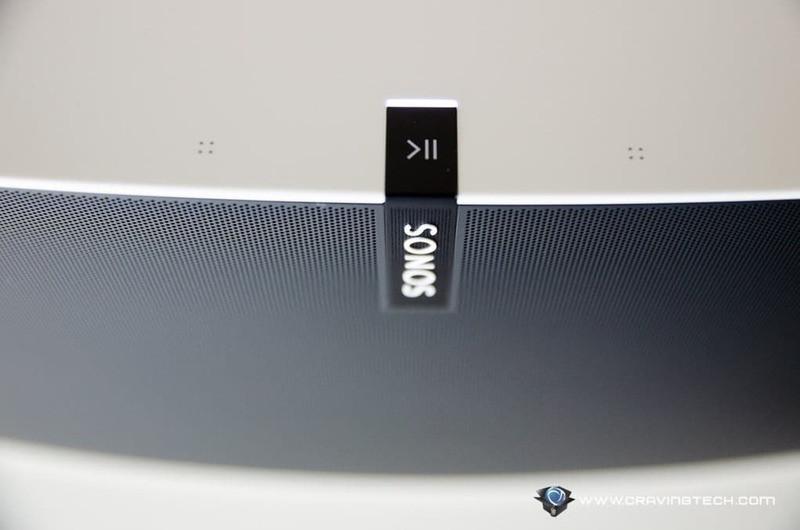 The rest of Sonos speakers seem tiny in comparison so if you are serious about sound, the PLAY:5 is definitely the one that can satisfy your needs. The new Sonos Play:5 has the cleanest design of a speaker that I haven’t seen in a while. Sure, it looks just like an ordinary speaker (unlike the Edifier Spinnaker), but its minimalist and elegant looks are stunning to behold. 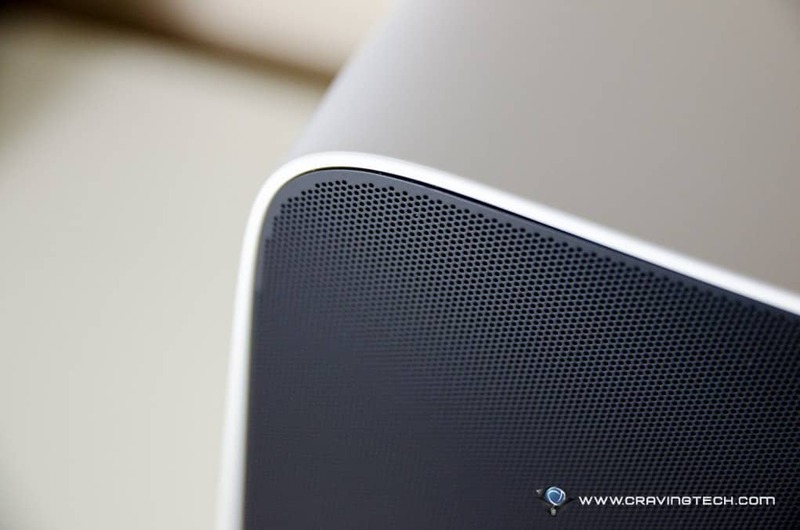 The white chassis variant I have here for the review looks much better than the black one (in my opinion), as it shows a nice contrast with the dark Sonos tag and speaker grill. Speaking of which, there are 60,000 individually drilled holes in the grill according to Sonos and we could definitely tell how much effort the team has thrown into designing the latest Sonos unit. All the design decisions (including the materials used) also help to further enhance the sound output. 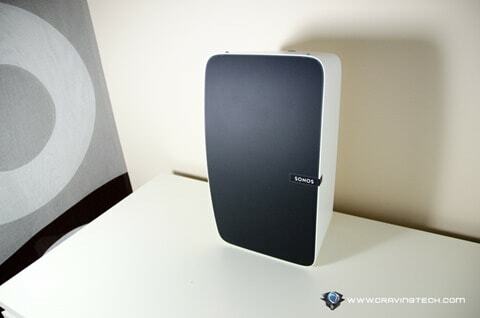 The speaker’s rubber feet ensures your unit to be scratch-free and you can place the Sonos PLAY:5 vertically (in 2 different ways) or horizontally to accommodate the desired space in your room. Gone were the traditional hard buttons and they are replaced with softer touch controls. The decision to switch to touch controls will become clearer when you change the speaker’s orientation, i.e: the ‘Raise Volume’ control will always be on top of the Play/Pause (even if you change the speaker orientation upside-down). Smart. You can also get a second pair of PLAY:5 and pair them in Stereo mode. Place 2 PLAY:5 units vertically for a tighter spot or horizontally to make the sound fill a bigger room. And if you like (+have the cash), go crazy and get the Sonos PLAYBAR and SUB for a true surround sound experience. 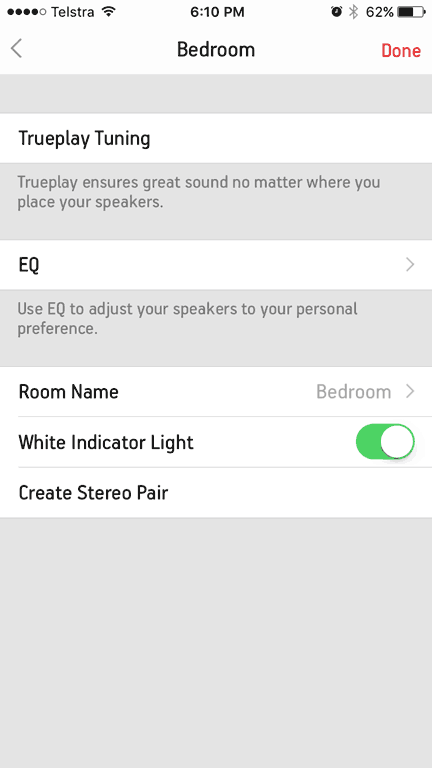 With the help of Sonos’ new Trueplay technology, your Sonos unit will be tweaked to match the condition of the room you are in (by analysing the acoustics of the room through how sound gets reflected). This is done through Sonos app and your smartphone’s microphone. I think unless you are an audio purist or set the speaker behind large objects or in a weird placement, you’d probably won’t feel much difference. 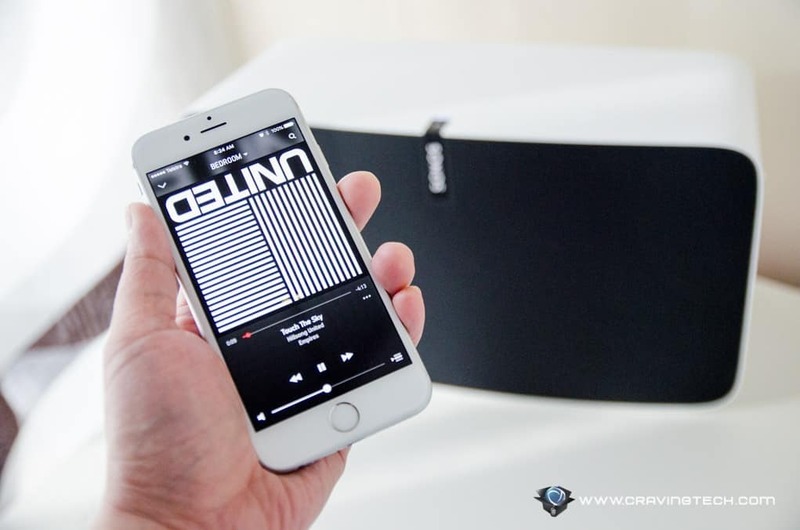 However, it is good to know that you’ll always get the best sound experience you can get from your Sonos speaker. 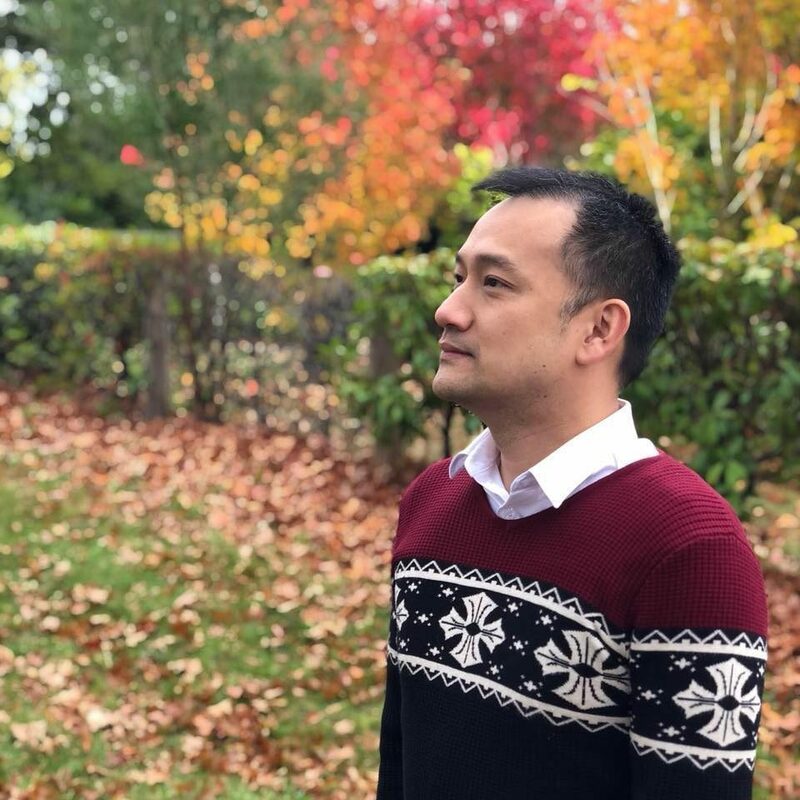 There is a good article about Sonos Trueplay at Pocket-lint if you want to find out more about it. Now, back to sound. 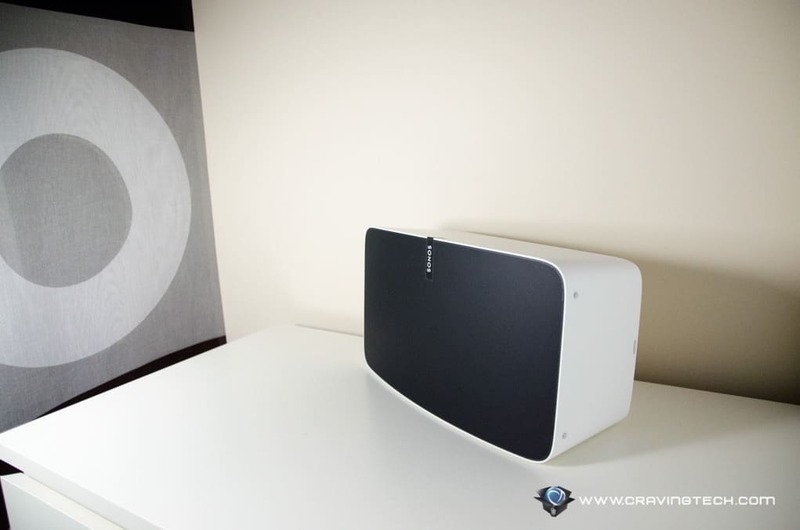 Sonos PLAY:5 will not disappoint you at all. It’s a powerful speaker that can dish out an ample amount of sound on any room setup. The channel separation is clear and amplified by Sonos internal speakers. I love the sound of the drum kicks and snares, and the acoustic instruments – which really pop, thanks to the PLAY:5. The Bass is powerful and deep. Vocals also gets a big attention which gives me chills when I listen to good vocalists. Closing my eyes to enjoy acoustic songs is where the gem really is with PLAY:5. The clarity of the sound at higher volume is simply good and true. Even if I crank the volume up, the sound doesn’t get distorted and I can’t hear any loss of quality. It feels as if you are in the recording studio with the artist and his/her band. But you probably don’t want to shell out $749 just for a speaker alone. The PLAY:5 has a high price point because you are also paying for the Sonos ecosystem, a smart system that takes advantage of your Wi-Fi to stream your music collection anywhere in the network/and from the cloud in high-quality. 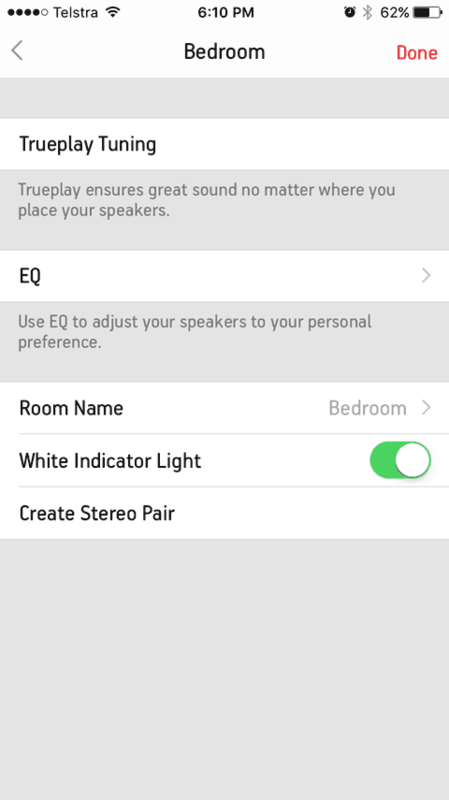 With the Sonos system, you can set-up multiple Sonos speakers in different rooms with different setups (or the same, your choice). With Sonos, your music collection is accessible anywhere and they will all work seamlessly with the Sonos speakers. 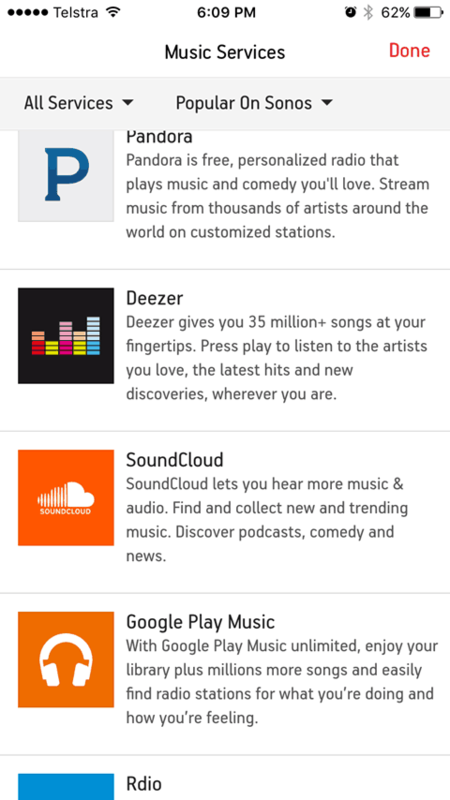 You can also do a song search on all music services you’ve added (like a universal search), access your Spotify playlists, and many other supported services like Google Play Music, Pandora, iHeartRadio, Rdio, and over a 100,000 free radio stations, shows, and podcasts. The PLAY:5 also supports an analog audio input connection with a 3.5mm (so you can connect it to your TV and other devices). 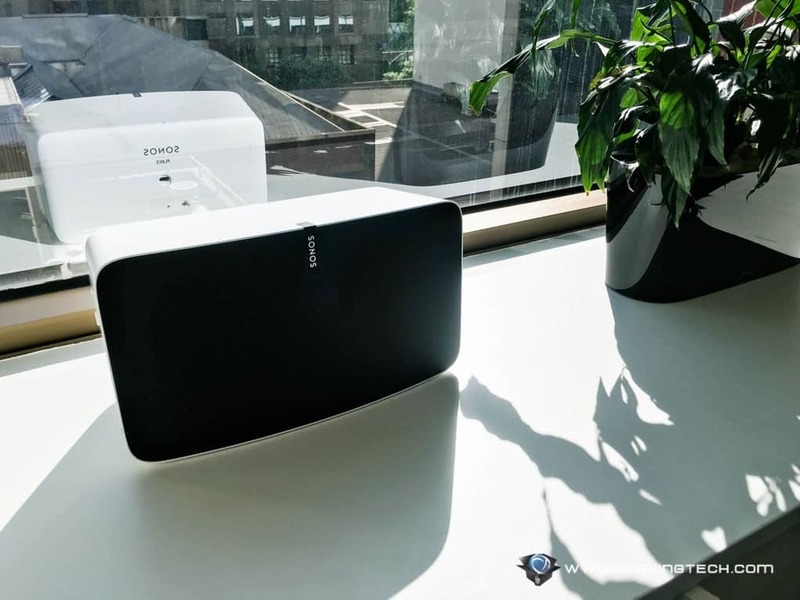 With Sonos PLAY:5 (2015), you’ll get the best Sonos experience possible with a minimalist and elegant speaker design, combined with powerful, clear, high-quality audio output. The speaker is a powerhouse but it’s not just loud, because the sound doesn’t get distorted even at higher volume. It manages to cope well with songs from different genre, but I personally like the audio clarity when it plays acoustic songs as all instruments and vocals come to life. 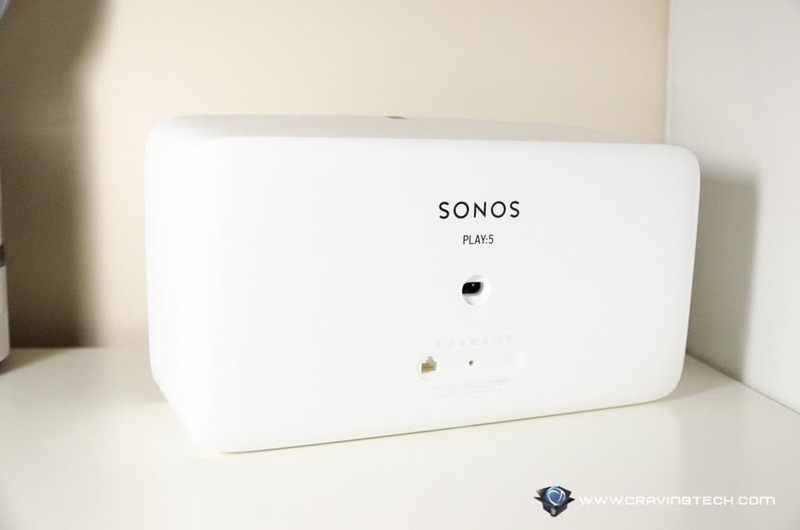 Saying that, however, the PLAY:5 is probably not for those on a budget, or living in a small unit, or not looking to invest in Sonos system in the long run. For that, feel free to grab the PLAY:1 to start with, as it is a really good Sonos speaker for its value. I’m sure you’ll crave for more, though.